There’s always something to pique your curiosity in Wilmington, North Carolina’s historic river district and the island beaches of Carolina Beach, Kure Beach, and Wrightsville Beach. Here are 10 great reasons to visit. You'll likely discover hundreds more reasons to return! 1. 31 Miles of Island Beaches beckon from the shores of Carolina Beach, Kure Beach and Wrightsville Beach. Attractions include nature tours, an aquarium, a Civil War battlefield, history museum, and a state park where Venus Flytrap grows wild. Relax at oceanfront resorts and beach cottages. Step back in time just minutes away in Historic Wilmington. 2. Historic River District: Walk along brick and ballast stone streets or watch the sun set from a riverside café in downtown Wilmington, recently voted Best American Riverfront & Best Al Fresco Dining Neighborhood by USA TODAY 10Best Readers&apos; Choice polls. Explore the 230-block National Register Historic District via riverboat cruise, horse-drawn carriage or trolley tour. Enjoy a gourmet dinner followed by a concert or live theater. Bunk in at a B&B, luxury riverfront hotel or other fine accommodations. Island beaches and a Civil War battlefield are just minutes away. 3. New & Nostalgic Attractions: There is always something new to see and do in Wilmington, N.C.’s historic river district and the island beaches of Carolina, Kure and Wrightsville. Island beaches, a historic riverfront town, and dozens of diverse attractions include the Battleship North Carolina, historic homes, museums, parks, gardens, movie locations, tours and more. 4. B&B Capital of N.C.&apos;s Coast: Wilmington, North Carolina is known as a bed-and-breakfast destination due to the high concentration of inns and the high standards maintained by area innkeepers. There are a dozen or so bed & breakfast inns located in Wilmington’s Historic River District and on Pleasure Island (Carolina/Kure beaches). 5. The Finer Things in Life: Dining, Shopping and Day Spas: From the river to the sea, experience the dining renaissance at new and established eateries, from casual bistros and old-fashioned diners to exquisite gourmet restaurants featuring local farm-to-table, seafood, and international cuisine. Plan to visit during Encore Restaurant Week (Spring and Fall; www.encorerestaurantweek.com). Shop at distinctive specialty shops, beach & downtown boutiques, upscale shopping complexes, custom jewelers, museum shops, 50+ antique shops, and 35+ art galleries. Pamper & rejuvenate at day spas. 6. 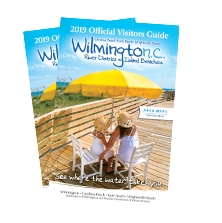 Family Fun: Discover why Wilmington, NC’s historic river district and island beaches are ideal for families with young children, tweens and teens. Family-friendly beaches, accommodations, restaurants & educational attractions make Wilmington, Carolina Beach, Kure Beach & Wrightsville Beach the ultimate in family appeal. 7. “Hollywood East”: Since 1983, Wilmington, North Carolina (a.k.a. "Hollywood East") has garnered hundreds of movie Credits (www.wilmingtonfilm.com). Filmmakers and visitors favor the area&apos;s mild climate, beautiful beaches, diverse architecture, varied landscapes, and historic district built along the scenic Cape Fear River. Experience "movie magic" with guided and self-guided walking tours of Downtown movie locations (www.hollywoodnc.com), and film festivals galore. Find our film trail at www.wilmingtonandbeaches.com/Hollywood-East. 8. Arts Alive! Arts and culture at the beach? You bet! A dynamic arts scene encompasses live music, theatrical and dance performances, arts festivals, film happenings, weekly Fourth Friday Gallery Walks, the Cameron Art Museum (Southeast N.C.&apos;s pinnacle of visual arts), Thalian Hall Center for Performing Arts (one of the nation&apos;s oldest theatres) and Cape Fear Community College&apos;s new Wilson Center (coastal NC&apos;s largest performing arts venue). 9. Explore Outdoors: A subtropical climate welcomes year-round golf, fishing, kayaking, canoeing and outdoor recreation. Golfers will find quality courses in Wilmington, including Wilmington Municipal Golf Course with its award-winning Donald Ross design. Anglers enjoy bottom, surf, deep-sea and pier fishing. There are dozens of fishing guides, tournaments, and 60+ fishing charters/head boats with half-day, full-day and Gulf Stream excursions.